Topcoat is straight and wiry, and the undercoat is dense and short. Can be white, cream, or white with light brown. This dog is a complex one. It is friendly, intelligent, and somewhat obedient, but it can be obstinate and stubborn. It can be dominant and watchful, yet sensitive and gentle-natured. Samoyeds love to bark. This dog is a complex one. It is friendly, intelligent, and somewhat obedient, but it can be obstinate and stubborn. It can be dominant and watchful, yet sensitive and gentle-natured. Samoyeds love to bark. Samoyeds are gentle with children but may try to dominate other dogs. They have a strong hunting instinct so they will chase other animals. They need to be trained early to get along with your other pets. You can find Samoyed puppies priced from $300 USD to $3000 USD with one of our credible breeders. Browse through our breeder's listings and find your perfect puppy at the perfect price. Samoyeds are gentle with children but may try to dominate other dogs. They have a strong hunting instinct so they will chase other animals. They need to be trained early to get along with your other pets. Too much brushing can harm the undercoat. A metal comb should be used to remove loose hairs during shedding. Training can be a challenge and needs to start early. Variety in the drills is key, as Samoyeds can get bored if asked to do the same task over and over and refuse to do anything. Screaming, shouting or hitting will not get the dog's respect, in fact it will produce the opposite effect. The dog will need to see you as both an authority figure and a friend. It must be trained to come to you when very young. This dog needs plenty of exercise. Three short walks a day is not enough for this breed. Take it for very long walks, or have it run alongside you as you ride a bicycle or go jogging. They like to wander, so a good fence around the yard is required. Samoyed Puppies for Sale - Shipped Worldwide! Finding the right Samoyed puppy can be dog gone hard work. PuppyFind® provides a convenient and efficient means of selecting and purchasing the perfect Samoyed puppy (or Samoyed puppies) from the comfort of your home, 24 hours a day, 7 days a week. Take advantage of our PuppySearch or leisurely browse our directory of hundreds of dog breeds, Samoyed dog breeders, Samoyed dogs for adoption, and Samoyed puppy for sale listings with photos and detailed descriptions. Some Samoyed puppies for sale may be shipped Worldwide and include crate and veterinarian checkup. 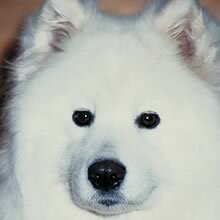 Many Samoyed dog breeders with puppies for sale also offer a health guarantee. With thousands of Samoyed puppies for sale and hundreds of Samoyed dog breeders, you're sure to find the perfect Samoyed puppy.